David Marlow followed a regimented path to success during a multidecade career as a boat designer, eventually retiring to his native Florida hard by Terra Ceia Bay in a restored, cracker-style home. But he couldn&apos;t stop thinking about hull design, spending hours tinkering in his workshop followed by towing scale models of his design behind his Boston Whaler. 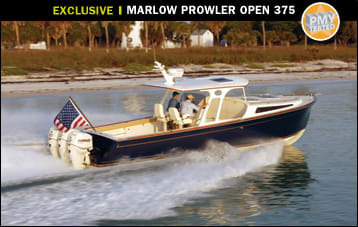 Eventually, no longer content as a retiree, Marlow came out of retirement to found Marlow Marine, premiering a 70-foot model at the 2001 Miami International Boat Show. It&apos;s reminiscent of The Marriage of Heaven and Hell, in which William Blake wrote, "Improvement makes straight roads. But the crooked roads...are roads of genius." 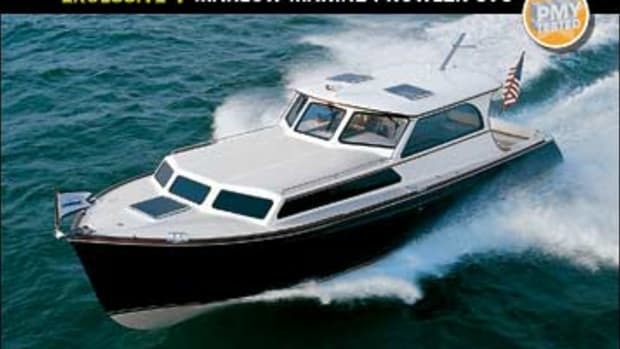 During construction of the 70-footer and subsequent models, Marlow rarely strayed from those straight roads. But diversions to the crooked roads began to surface. 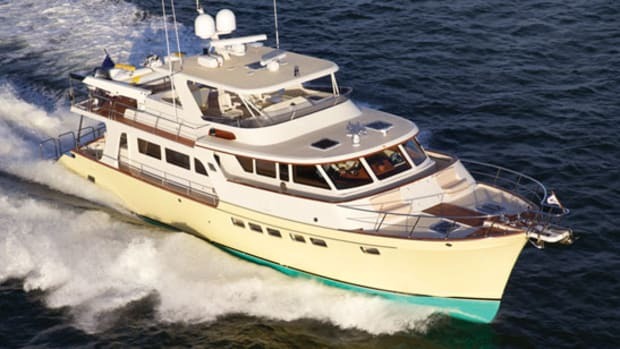 One of those departures took place a few years ago at Norsemen Shipbuilding, Marlow Marine&apos;s Xiamen, China-based boatbuilding facility, where he took a rigid management approach that had worked in the past. "For a long time [I believed] that the nail that sticks up should be driven down," he told me over coffee at Marlow Marine&apos;s Snead Island, Florida, boatyard, a 20-minute drive from Sarasota. I had an impending sea trial on the Marlow Prowler Open 375 and was eager to board her, but nothing beats good conversation with an old boatbuilder over a cup of joe, so I sat, sipped, and listened. Marlow went on to tell me how his authoritarian method boomeranged on him, most noticeably in the way factory workers would scatter in his presence. He was mortified. After building a state-of-the-art factory and hiring artisans and craftspeople from a nearby millennia-old fishing—i.e. boatbuilding—community, he was isolated and unable to benefit from the invaluable input of the locals. So Marlow spun on his heels and began to heed suggestions from his employees, with splendid results. Now during his visits there, his schedule is crammed with appointments from an enthusiastic staff whose creative suggestions help the factory operate more efficiently and also instill workplace pride. Enlightened by the communication that&apos;s now the protocol at Norseman, Marlow was able to direct his focus to other projects, namely into the Prowler series, custom boats inspired by the hooch-running speedsters he spied in his youth while working the docks in nearby Cortez. 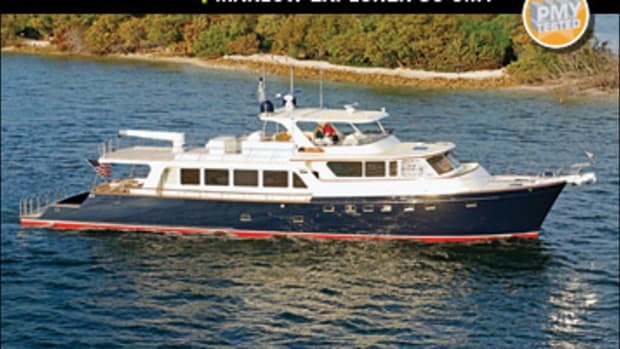 When I lugged my Pelican case of test gear alongside the Prowler Open 375, docked stern-to on the Manatee River, I could almost picture her cockpit brimming with Havana&apos;s finest rum, as those of her rough-and-tumble predecessors once were. 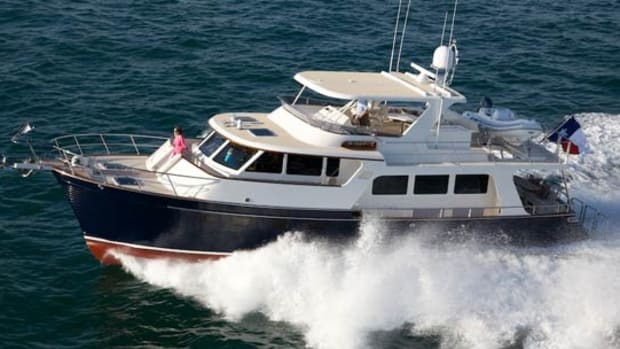 As I took in her graceful sheerline, deep blue topsides, and tumblehome, one thing became as clear to me as the spring-fed waters at Marlow Marine: David Marlow marches to a drum that others do not hear, which is why this 37-footer is unlike any outboard-equipped center console out there. It&apos;s not just the 375&apos;s look, it&apos;s the details that put her in a league of her own. 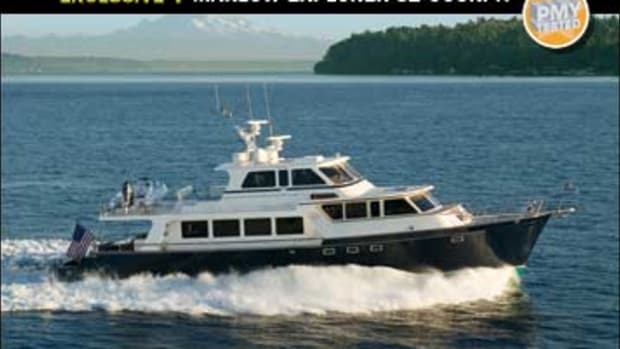 Her nonskid, a deep cream with white borders, complements her tan Ultraleather coaming padding, the white 52-gallon livewell/fish-prep station at her transom, a pair of white Stidd chairs at her helm, and an Ultraleather L-shape settee just forward of the helm. 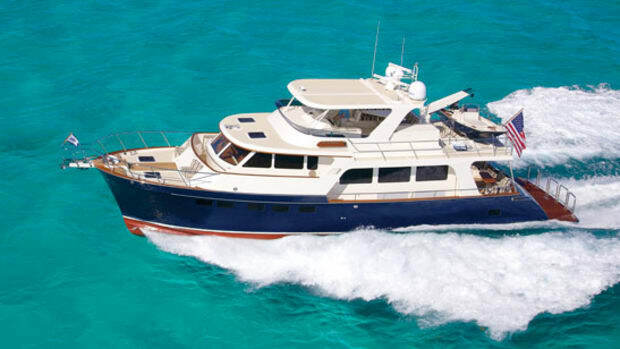 A teak toerail and a large hardtop—"This boat is too special for a simple bimini top," Marlow says—that&apos;s also accented in teak complete her look. Simply put, she&apos;s gorgeous. But where a beautiful exterior might be enough for some boatbuilders, Marlow added custom touches like the nonskid&apos;s design. Among the most sure-footed surfaces I&apos;ve encountered on a vessel, Marlow says it was inspired by octopus tentacles, which he saw on the side of a fish tank. Then there&apos;s the macerator-equipped livewell that can be backlit, turning it into an illuminated aquarium. Or the coaming padding, which is hinged at the top to provide access to the port and starboard rod stowage. The originality continues below decks, where you won&apos;t find a utilitarian head-stowage space or a spartan V-berth. 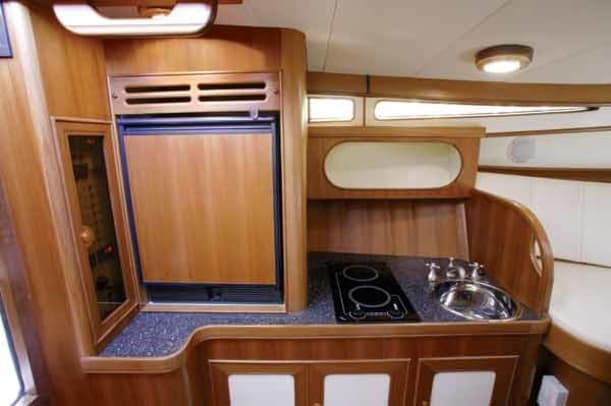 Instead there are exquisite teak bulkheads and port-side galley cabinetry. Where many builders will use teak from varying sources, Marlow insists on buying entire trees, so that each interior is cut and planed from one source, ensuring an exact grain match. 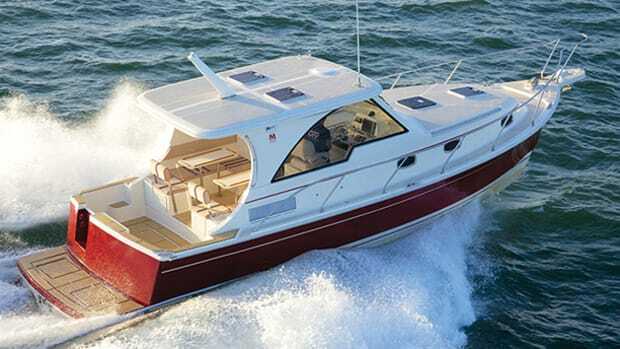 The saloon&apos;s ideal for overnights or for relaxing while the fish aren&apos;t biting: The V-berth that converts to a double with the addition of a cushion to the saloon&apos;s teak dining table, 16,000-Btu air conditioning, and a Sharp 13-inch LCD TV help create a comfort zone here. Innovative construction techniques also exemplify Marlow&apos;s crooked-road inspirations. The 375 does not have a traditional stringer system: For construction purposes, the vessel utilizes a ring-frame system adapted from airplane fuselage combined with Marlow&apos;s own RIVAT core-infusion process that forms longitudinal I-beams within a tough, Kevlar and carbon fiber-reinforced sandwich. I wanted to run her into a six-foot head sea at 35 mph to see how tough she really is, but conditions were dead-calm on Terra Ceia Bay; still, running her was a blast. "I think we got the hull right," Marlow commented, and I have to agree. I put the 375 through a series of tight turns at WOT and weaved her through crab pots with ease, and at all speeds she tracked with straight-as-a-string authority. Bow rise never exceeded three degrees. The triple 250-hp Evinrude E-Tec two-strokes are a great match—the torquey powerplants had her out of the hole fast, hitting 40 mph in 15 seconds on her way to an average top hop of 45.5 mph. They&apos;re also stingy: At a fast cruise of 36.8 mph at 4000 rpm, the 375&apos;s are good for better than 1 mpg and a range of 459 miles. 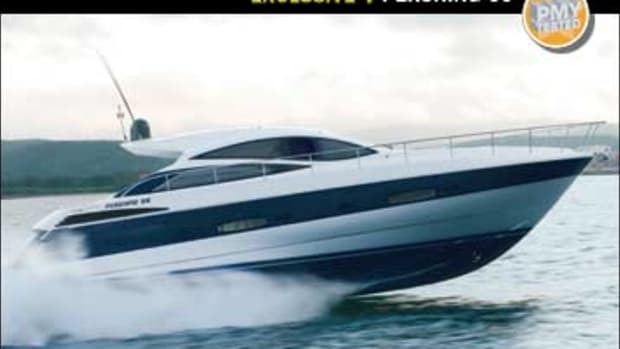 For those who prefer diesel power, twin inboards from Yanmar are also available up to 500 hp each. After visiting with the man behind the superlative Prowler Open 375, I&apos;m glad they march to a different drummer at Marlow Marine. I am also glad that Prohibition was overturned long ago. 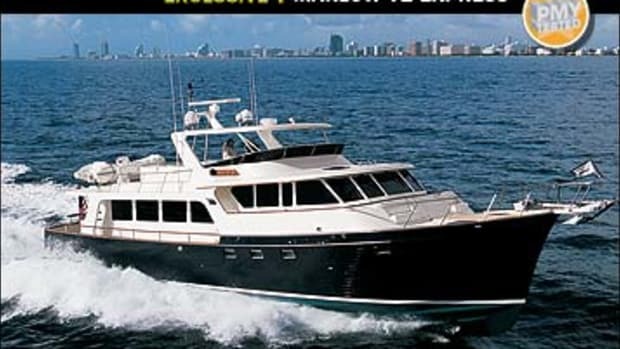 Otherwise, it wouldn&apos;t take too much wrangling to get me aboard the 375 for a run to Cuba for some fine rum.